This is part of a series remembering and honoring evaluation pioneers leading up to Memorial Day in the USA (May 30). I am Rodney Hopson, Professor of Education Policy and Evaluation at George Mason University and former (2012) President of AEA. 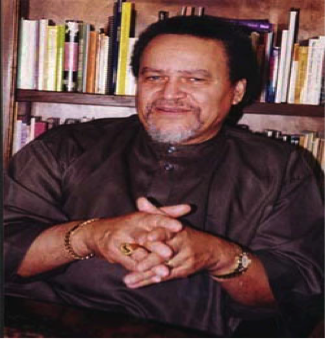 Asa G. Hillard III (Baffour Amankwatia II), is one of the evaluation pioneers documented in the Nobody Knows My Name (named after a book by James Baldwin) Project that uncovers the untold contributions of African American educational researchers and evaluators in the United States during the pre-Brown v. Board era. While Hilliard’s major work did not take place pre-Brown, he is a name associated with the Nobody Knows My Name Project and is a name that all evaluators should know. Trained as an educational psychologist (University of Denver, 1963), Hilliard’s research and practice spanned educational policy, special education, anthropology, child development, and classical African civilizations, Hilliard was one of the first African Americans to provide a keynote at the American Evaluation Association conference (in 1988). Hilliard’s presentation was later published in Evaluation Practice (the precursor to the American Journal of Evaluation) in 1989 and provided ways for evaluators to think differently about data visualization, truth and evidence and the implications for cross-cultural evaluators. In recent years, the American Evaluation Association has sponsored Think Tank sessions at its annual conference in his honor previously co-sponsored by Indigenous Peoples, MultiEthnic and Social Work Topical Interest Groups to introduce his practice to AEA members and conference goers. When names like Ralph Tyler, Robert Ingle, and Marcia Guttentag are remembered, so should those like Reid E. Jackson, Asa Hilliard, and Rose Butler Browne. Their cumulative scholarship and evaluation agenda-setting both laid a foundation for policies, legislation, and counter-narratives that challenged the racial hegemony and institutional segregation that existed in the United States and contributed to the intellectual development of democratic, equitable, and culturally responsive evaluation more generally. Hilliard, A. G. (1989). Kemetic (Egyptian) historical revision: Implications for cross-cultural evaluation and research in education. Evaluation Practice, 10(2), 7–23. Hood, S. & Hopson, R.K. (2008). Evaluation roots reconsidered: Asa Hilliard, a Fallen Hero in the “Nobody Knows My Name” Project, and African Educational Excellence. Review of Educational Research, 78(3), 410-426. Hood, S., Hopson, R., and Kirkhart, K. (2015). Culturally Responsive Evaluation: Theory, practice, and future implications. In Newcomer, K. and Hatry, H (Eds.). Handbook on Practical Program Evaluation (4th ed.) (pp. 281-317). San Francisco, CA: Jossey-Bass. What a great day to honor Dr. Hilliard’s tireless and methodical scholarship. Thank you, Rodney, for calling him to our consciousness. What a great day to honor Dr. Hillard’s tireless and methodical scholarship. Thank you, Rodney, for calling him to our consciousness. Great post, Rodney, and a treat to hear about great minds who were not on the reading lists in graduate school. Would absolutely love to see an AEA award in the name of one of those mentioned, and/or one of our living intellectual giants of color. It is a powerful way to have people (nominators, nominees, and the rest of us) reflect on the contributions that have made evaluation such a rich and exciting field but have gone under the radar.